LAS VEGAS – April 25, 2016 – Now rolling into The Liberace Garage (www.liberace.org) at the Hollywood Cars Museum, Las Vegas, in all of its red, white and blue splendor, is the late entertainer’s Bicentennial Rolls Royce, a 1952 Silver Dawn two light convertible London Motor Show car. 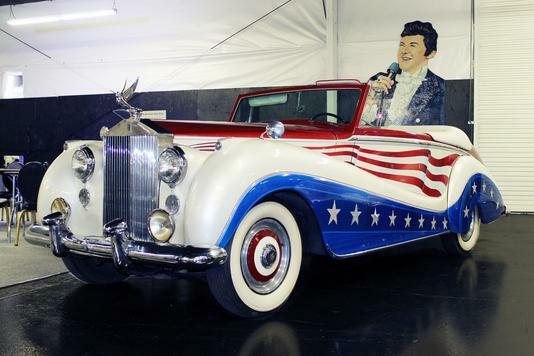 Designed for the “Liberace Show ’76,” the majestic vehicle was used on stage at the Las Vegas Hilton, with Liberace flying out of it via high wire cables while fireworks exploded and “Stars and Stripes Forever” played. It was later used at Radio City Music Hall in New York City for the 100th anniversary of the Statue of Liberty. For Liberace, cars were often an extension of his wardrobe. So naturally, accompanying the Rolls is an updated version of a red, white and blue “Hot Pants” costume. Launched with a gala catered cocktail reception at the Museum in early April, the Liberace Garage – now open to the public – is a collaboration between The Liberace Foundation for the Performing and Creative Arts (www.liberace.org) and Hollywood Cars Museum at Hot Rod City, Las Vegas (www.hollywoodcarsmuseum.com). The event was a fundraiser for the foundation, which has provided over $6 million in scholarships in the creative and performing arts since 1981. The Liberace Garage also includes the crystal encrusted roadster that he had onstage during his final run of shows at Radio City Music Hall in 1986, and a large handful of cars he drove regularly, including the London Taxi (with the meter still installed) that he used to pick up famous guests from the Palm Springs Airport and the Bradley GT gold flaked sports car, among others. The Hollywood Cars Museum at Hot Rod City is presented by Michael Dezer (www.dezercollection.com), owner of one of the world’s largest vehicle collections at the Miami Auto Museum. It features vehicles that have appeared in more than 100 films, TV shows and videos and many wild custom creations.